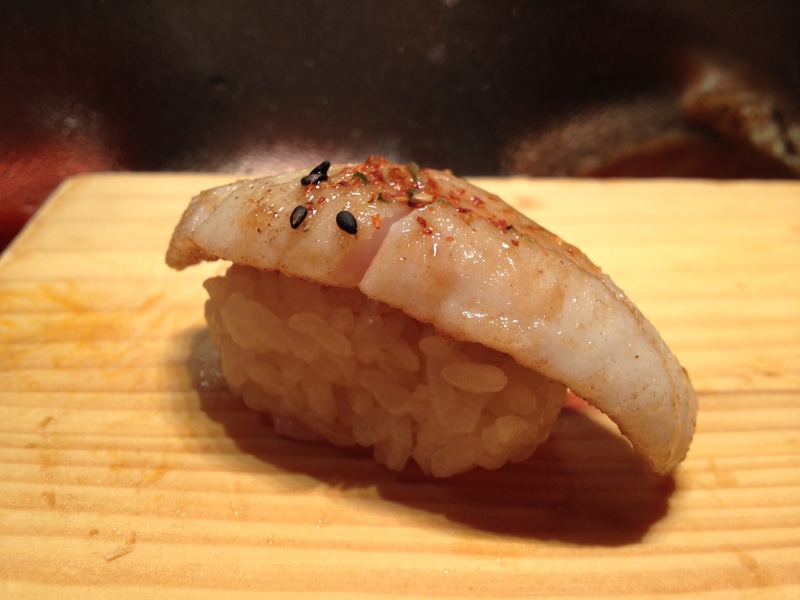 -”Sushi” technically just refers to the rice, but I’m just going to use it to describe the entire piece of nigiri. 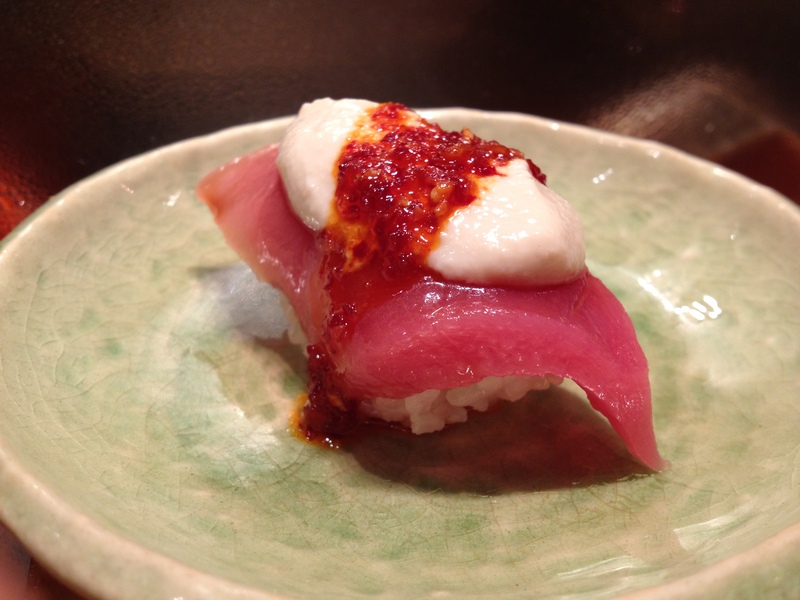 -Gari’s pretty well-known for having more modern, “fusion” sushi. His food isn’t traditional at all; he has more modern takes on sushi, such as his “salmon with roasted tomato and sweet onion sauce” or “tuna with tofu sauce and spicy sesame”. Gari is one of the few sushi chefs who plays around with sushi and actually does a pretty good job of it (he doesn’t just come up with new rolls). Part of me definitely likes seeing the different ingredient combinations and tastes he comes up with! Some like his food, and some don’t. I’m in the former camp. -Monty and I spontaneously decided to eat here, and we ordered omakase (which is a Japanese phrase that means “I’ll trust you/I’ll leave it to you”). Basically, you eat whatever the sushi chef gives you! I like eating omakase because it frees me from having to choose what to order and because it’s a pretty good glimpse into how good the sushi chef is (how he paces things, what kinds of fish he chooses, what order he chooses, and so on). I also like just being able to focus on taste and nothing else at times haha; I can just eat whatever the chef gives me! –We just wanted sushi and no sashimi (basically, we just wanted nigiri). The seafood was pretty fresh, and the sushi was delicious. -We were kind of curious at what point they’d run out of ideas for sushi combinations. I feel like they ran out at around piece 23 or 24. 1. Golden snapper with dried seaweed. 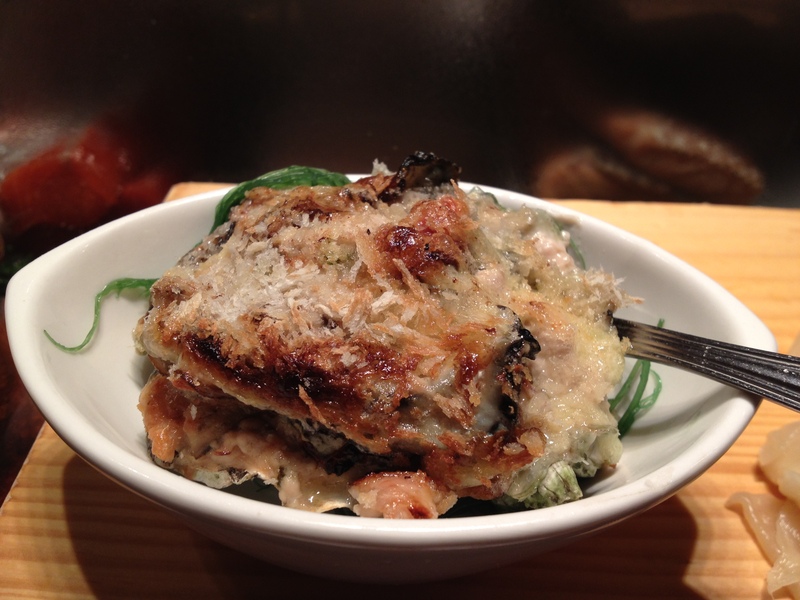 Monte: I liked this dish – it was a weird starter and immediately had me on my toes to expect the unexpected. The seaweed tasted like a strange asian dried herbal medicine – not in an unpleasant way though. It was just really intense in its smokey woody flavor. Strangely enough, I didn’t think the snapper was overpowered. 2. 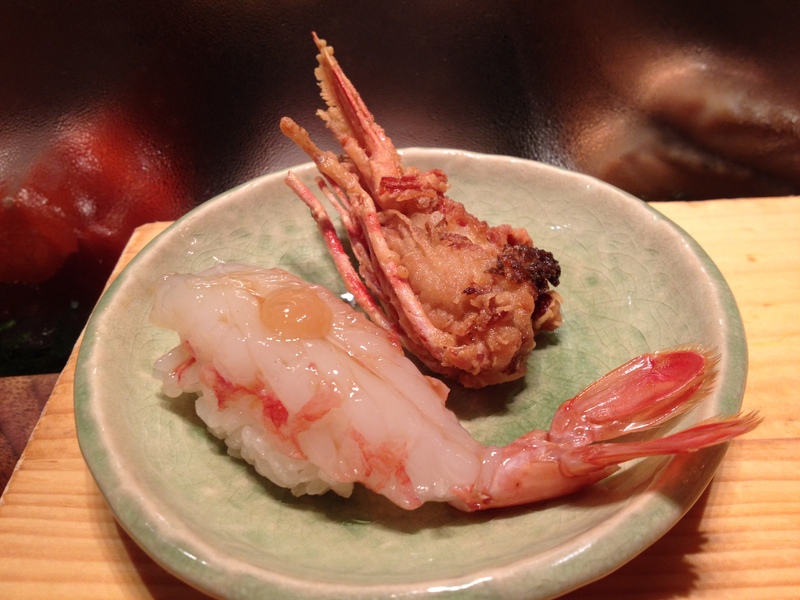 Ebi with yuzu-miso sauce, with the head on the side. The head’s also served in case you want to eat it. Naturally, we ate it all. Couldn’t help it. Monte: More than couldn’t help it – I would’ve specifically requested for it, the head is the best (isn’t it always?). I love the sweetness of fresh shrimp – very few things in life are finer. 3. 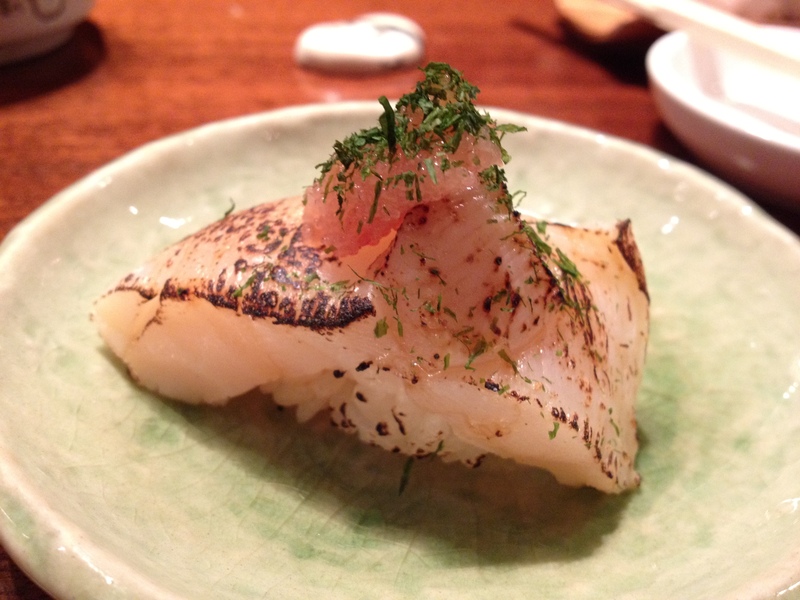 Miso-marinated Gindara (black cod). Monte: I’ve had bad cod before. It was the fish & chips dish at BJs – the fish had a really sour fishy smell to it. This miso marinated code was not like that. 5. 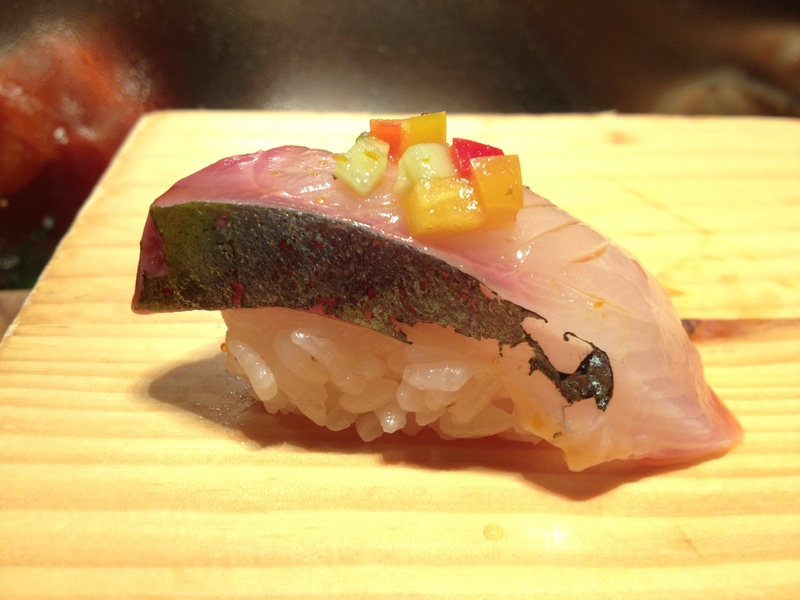 Shima aji with ceviche. 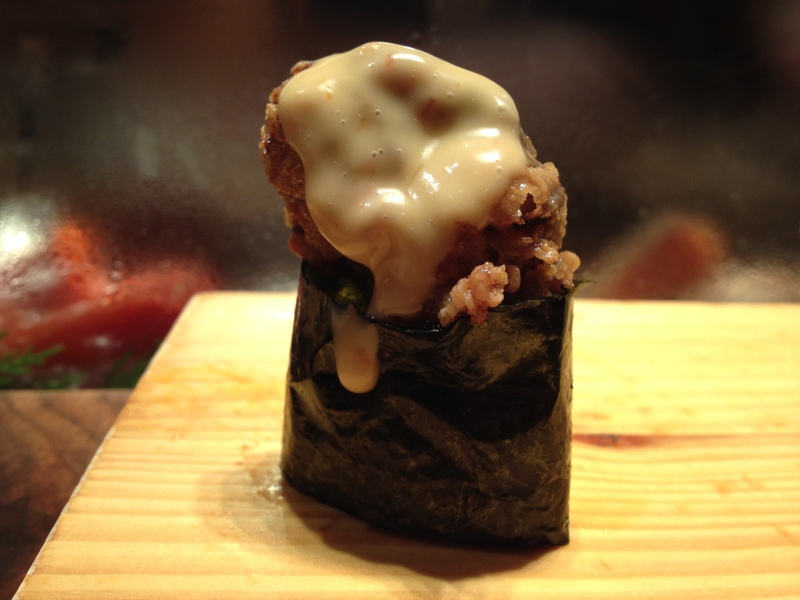 Monte: I love this playful marriage of latin and japanese cuisine. The ceviche had that acidic sour and spicy flavor well-known to Peru, but it was a clear complementary player while the sweet fluffy rice of the nigiri and lean shima aji shined. Monte: This dish was a little too much – too big and too hot! The juicy oyster bursts in the mouth with a vengeful splash of boiling oyster innards and scalds the tongue. But oh, it’s so delicious. 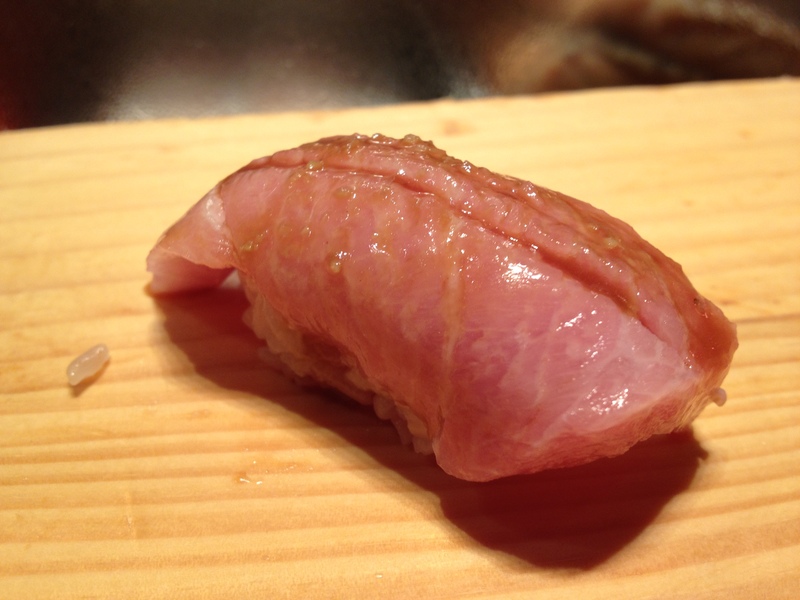 Meaty and salty – descriptions not too commonly found when eating sushi. Monte: Hands down the most inventive and enjoyable dish of the night. The tomato is hot and slightly crispy while the salmon is creamy and sweet. A combo I would’ve never imagined, and it elicited a reaction on par with the otoro. I slumped in my chair and just allowed the euphoria to wash over. 8. 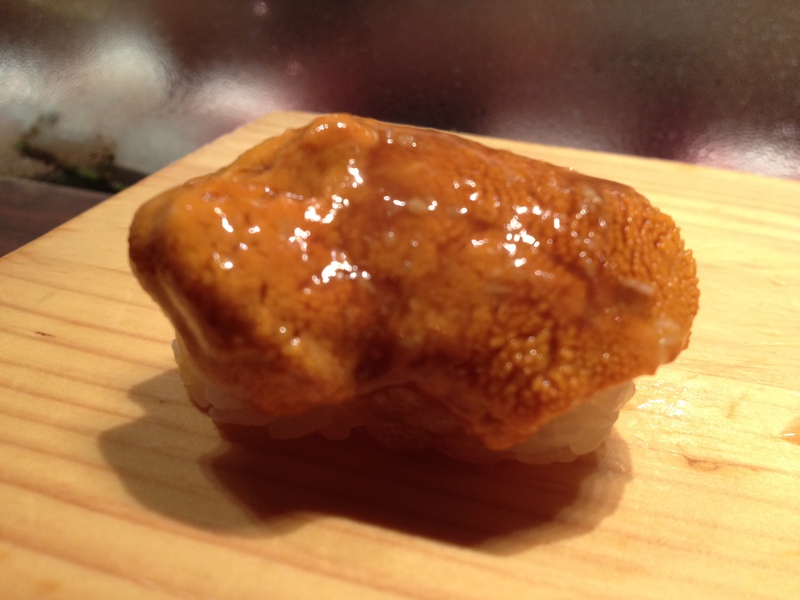 Uni with wasabi sauce. Monte: I love uni. If you ever want to give me a present, uni would be more than acceptable – and Gari’s is exceptional. 9. 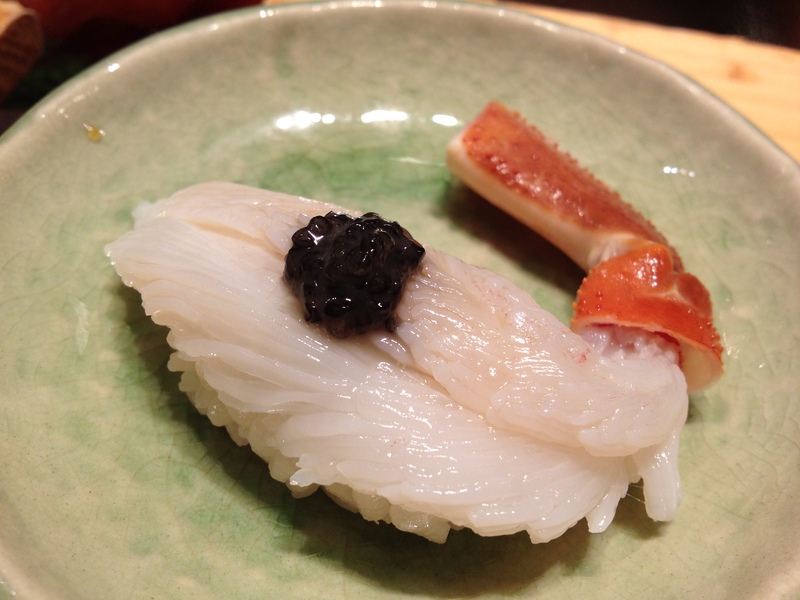 Snow crab with caviar. Monte: I love the sweetness of this fresh crab. The way that crab just slightly shreds and every individual fibrous string has a burst of flavor – it’s awesome. 10. Tuna with tofu and cheese sauce. Monte: What’s a salmon mackerel? Did a salmon and a mackerel hook up? Whatever it is, it’s tasty – the texture was a little flaky and fatty – more of an american style fish I s’ppose. I really liked the sweet smoky sauce on top – and a little green onion makes everything fresher. Monte: Spicy fish! 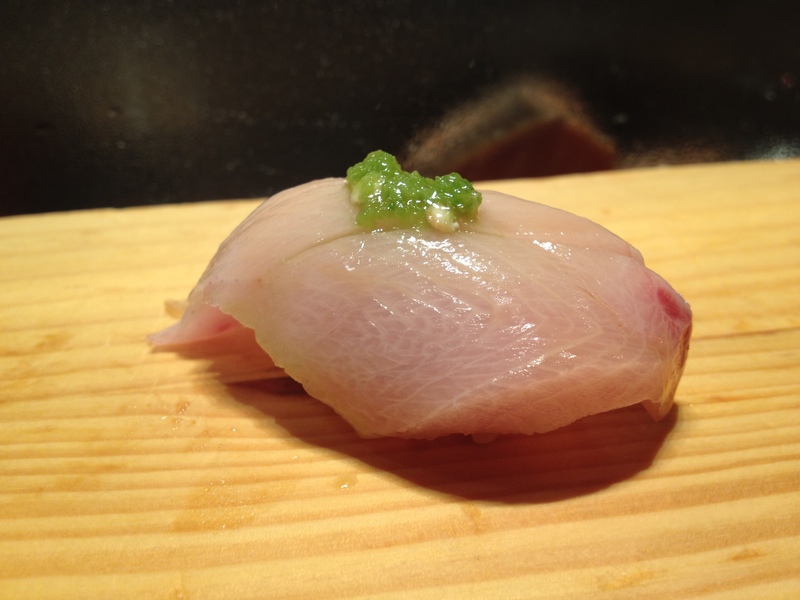 Acidic and sour, but hamachi is oh so sweet and fatty. I thought this would evoke associations with Mexican food but it didn’t. Oh wellz. 13. Red snapper with salad, pine nuts, and lotus root. Monte: I liked this dish for being very fresh. The lotus root is very crunchy, whereas the pine nut salad added a very interesting nutty element to sushi that I had never before encountered. I wouldn’t necessarily say the flavors are a home run, but it was thought provoking and, at worst, pretty good. 14. Sockeye salmon with cucumber sauce. Sockeye salmon skin behind it. Monte: I loved this dish. 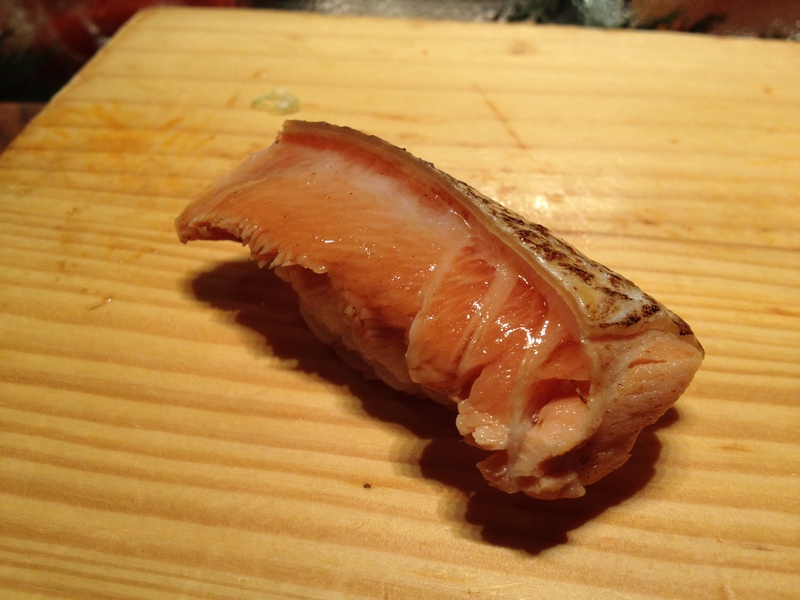 I really like it when I eat salmon that has all the usual sweetness of salmon sashimi, but with less of the fatty tones – a leaner but just as delicious salmon sashimi. This is just what I wanted. 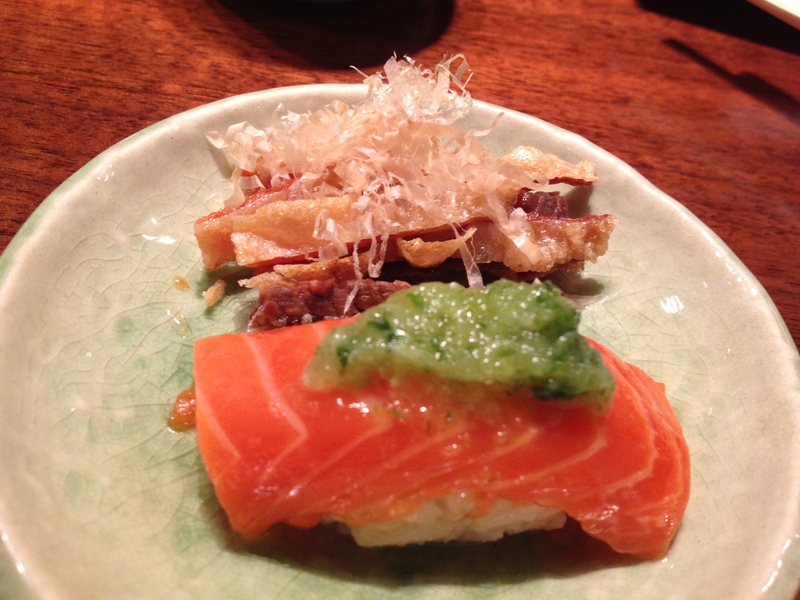 And the crispy salmon skin was like eating salty crunchy strips of seafood bacon. 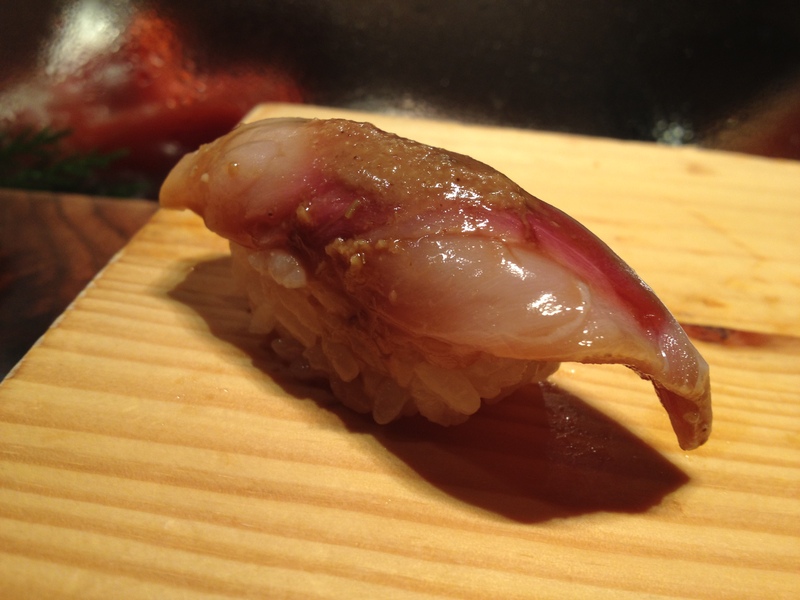 Monte: This Aji was slightly smoky, sweet, and with very lean flesh. As I bit into it, I could feel the meat almost “crunch” beneath my teeth (a reflection of why, if given the choice, I would prefer leaner salmon over fattier salmon – the texture is more satisfying). 16. Foie gras with slow-cooked radish and balsamic sauce. Monte: Ooooh foie nigiri. There is a heaven. And it is here. This piece was just a fatty sweet smokey (very smokey – maybe it was char grilled?) slightly acidic from the balsamic and meaty piece of nigiri that bursts into the mouth and caused me to just smile foolishly, incapable of further chewing until the initial elation subsided. I sat there smiling for a long time. They say food is pleasure and this foie nigiri holds nothing back. 17. 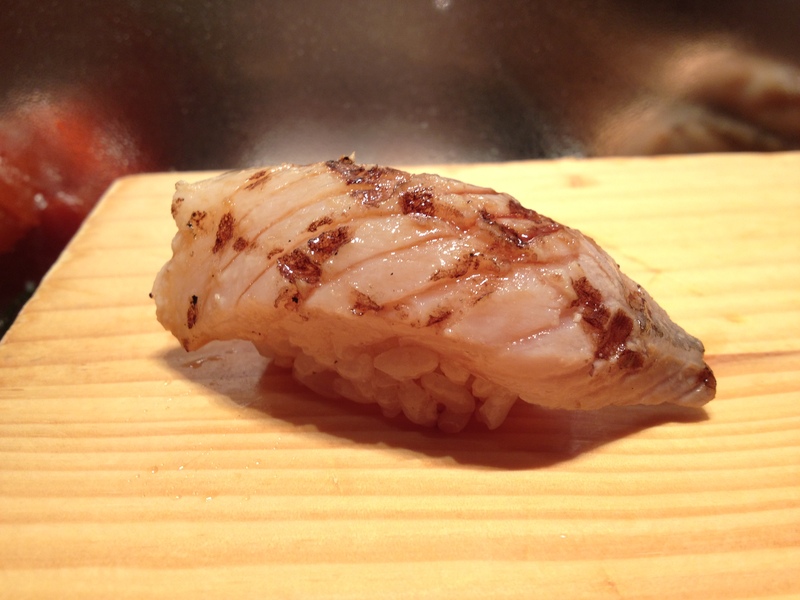 Butterfish with… something. I forgot :(. WHOOPS. Forgot to write this one down! 18. Fluke fin with poached quail egg and truffle oil. Monte: I love quail egg with sushi. Quail eggs just taste so much more delicate than chicken eggs, and yet they add a really creamy richness to the rice. 19. 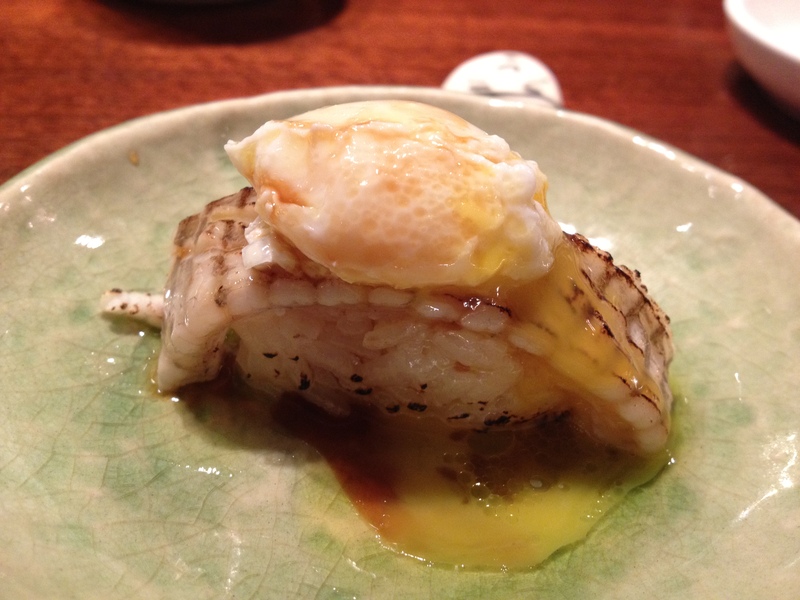 Seared scallop with cod and eggs. Monte: This piece was monstrously sized. At this point, I started wondering if there was too much of a good thing, if the gluttony was sinful. And while I was wondering, I chewed on perfectly smokey sweet scallop with delightful bundles of sweet rice mixed inbetween. 20. BBQ toro with ginger sauce. 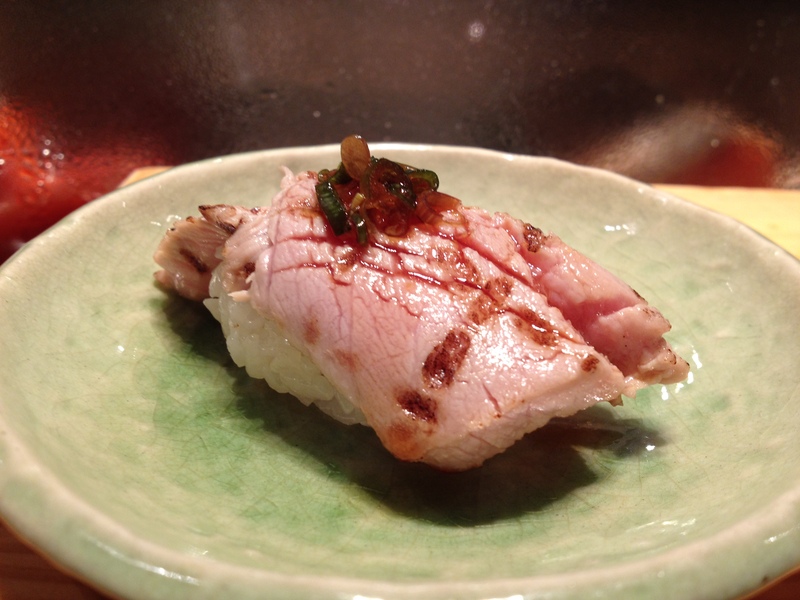 Monte: Creamy sweet smokey sour spicy (ginger) salty otoro? Does anybody think this would be bad? By now I was feeling pretty darn guilty about my gluttony. 21. Marinated lobster with salt. 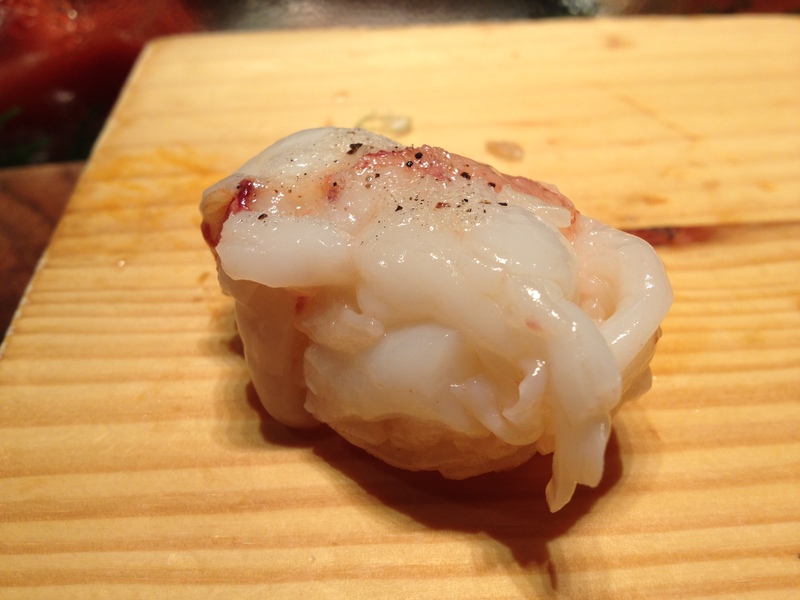 Monte: Sweet and lean lobster meat. With, again and as always with this meal, a fluffy bed of slightly sour and slightly sweet rice. Yes, it’s self indulgent and absolutely greedy. Without a doubt this meal was lustful and elicited sloth-like reactions of foolish smiling and slow nods of appreciation. But it was oh. so. good. The oyster was fried, yet the flavor of the oyster was still strongly there. I was somewhat confused by that :(. Oh well, it was DELICIOUS! Monte: More of a kushikatsu style fry than tempura fry, but yes this was great. The oyster is really hot and just bursts its innards into your mouth, while being complemented by the sweet creamy sauce. Like popcorn shrimp on crack, sprinkled with more crack – this dish was addicting. 23. 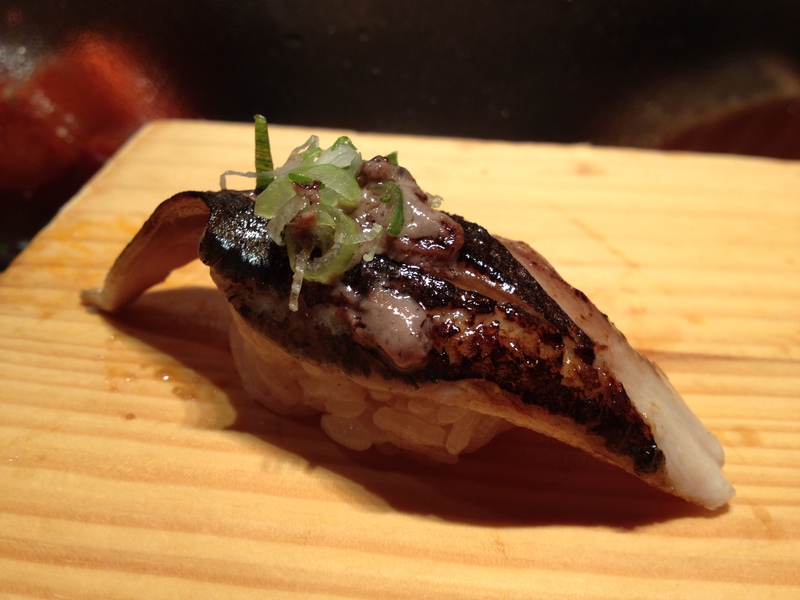 Fresh mackerel with white sesame soy. This one was the beginning of the “Ehh, these aren’t as amazing” dishes. 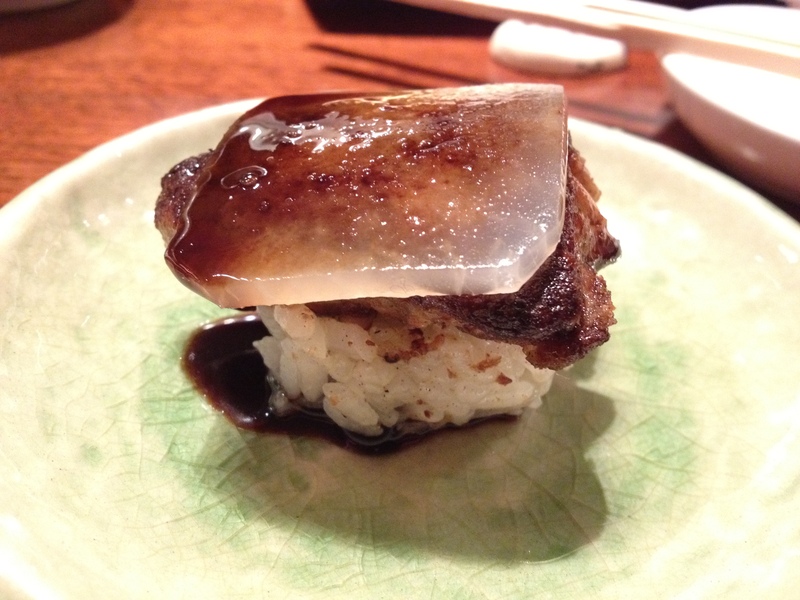 Monte: I like the smokey saltiness of mackeral, and the rice was still perfect. Still, the nervous glances from the chefs were a bit distracting. What were they thinking? That we’re crazy?? Probably not entirely wrong. 24. 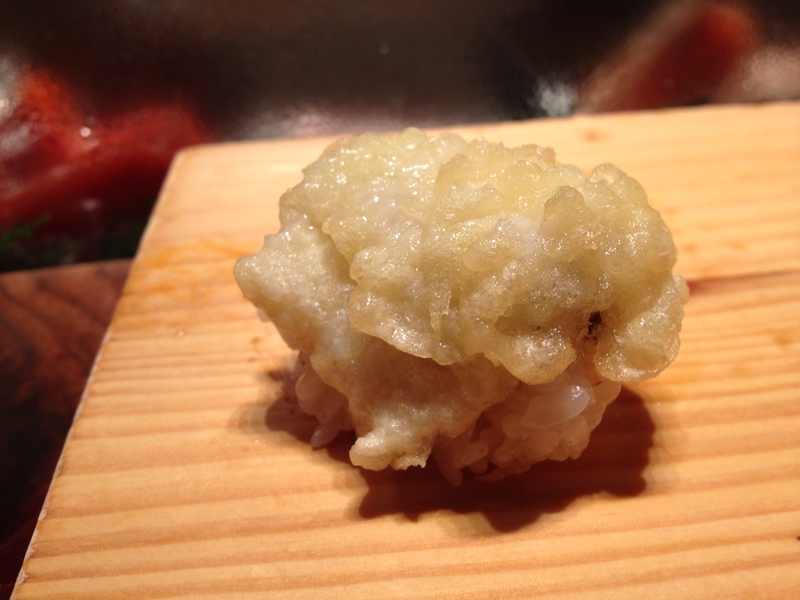 Japanese pike tempura with sea salt and lemon. 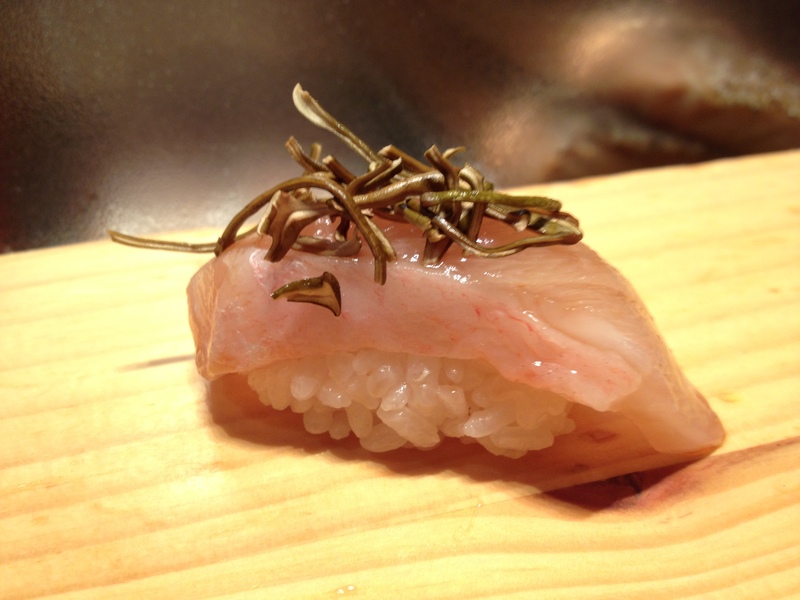 Monte: The pike was very light and flaky, but I thought the sea salt and lemon was too light and the nigiri felt underseasoned. The meal definitely felt like we were given the star dishes towards the beginning/middle (that sounds so much brattier than I meant it to be). -After we had this piece, Monty and I were, like, “Are they running out of ideas? IT SEEMS LIKE WE’RE TOO FAT FOR THEM…” The waitresses and sushi chefs seemed somewhat unsettled by the fact that we kept on going and hadn’t stopped eating yet hahaha. They were probably trying to do new pieces on the spot for us :(. -It was DELICIOUS, but it wasn’t special or anything. Basically, it kind of paled in comparison to the first 23 or so pieces. Monte: I thought this dish was great, if somewhat redundant. 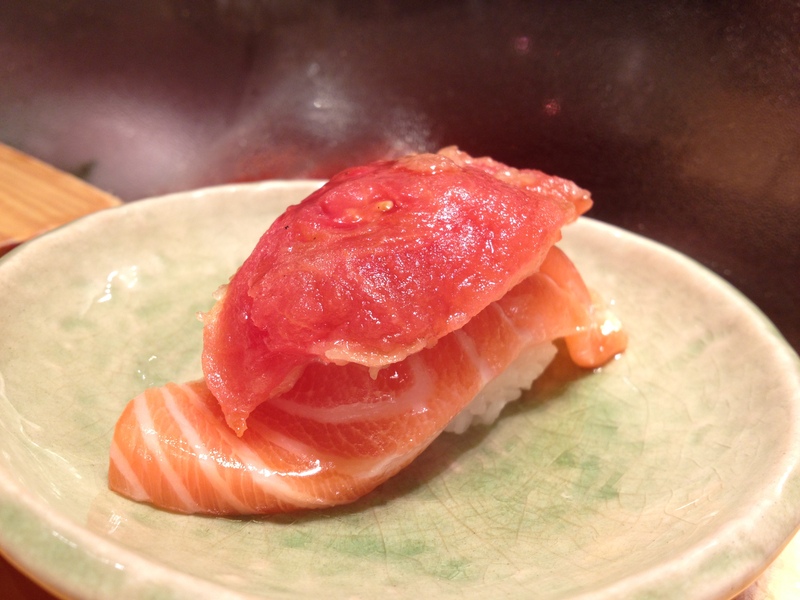 It didn’t add too much of a different experience from that of the salmon-tomato or otoro, since the fatty texture of otoro and sweet of salmon was experienced prior in the meal. But, that’s just being picky. I definitely would’ve eaten another one of these if placed in front of me. 26. 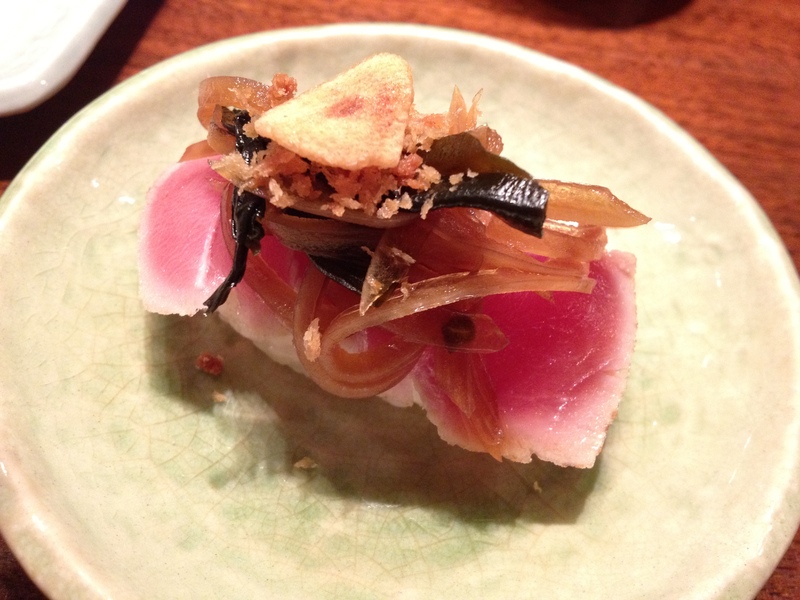 Seared tuna with marinated sweet onion, seaweed, and garlic. Monte: I wasn’t a fan of this flavor combination, since I felt like all the different elements really overpowered the fish and even the rice. The sweetness of the sushi was just lost amongst the garlic and onion. 27. 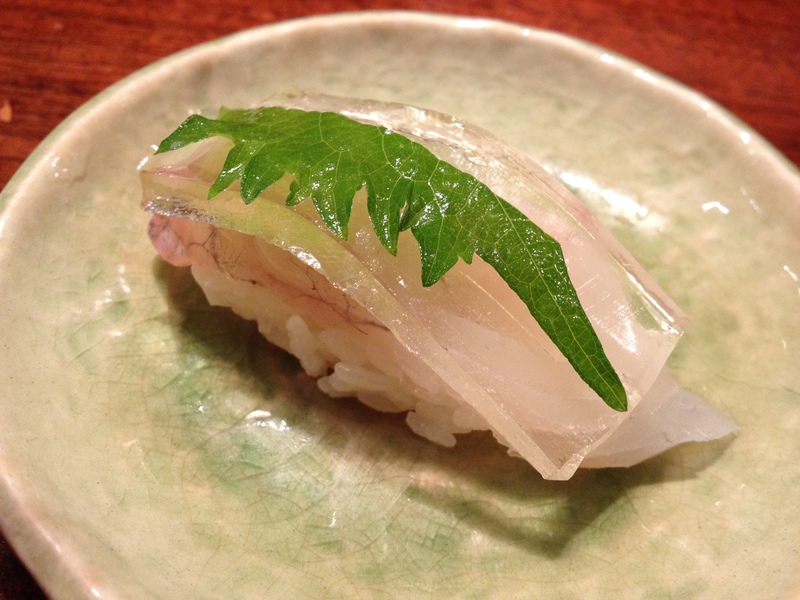 Fluke, marinated jelly, and shiso. 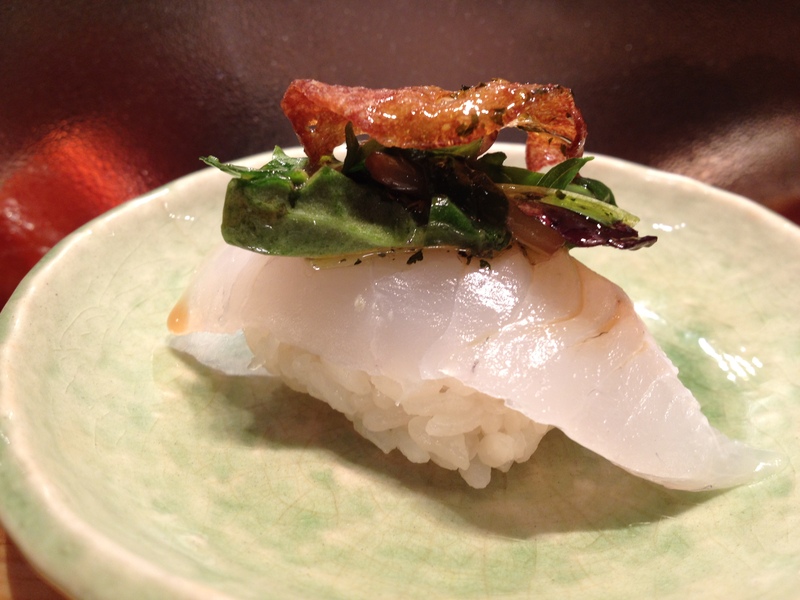 Monte: Shiso flavor is really lemony and herbacious, which I felt kind of overpowered this dish as well. All I could taste was shiso, and not the fish. However, I do like shiso! 28. 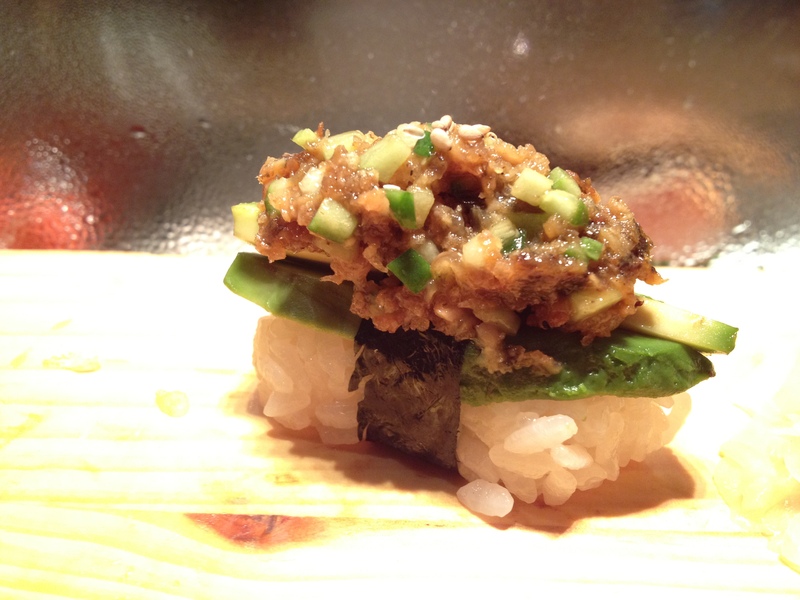 Chopped eel with avocado. 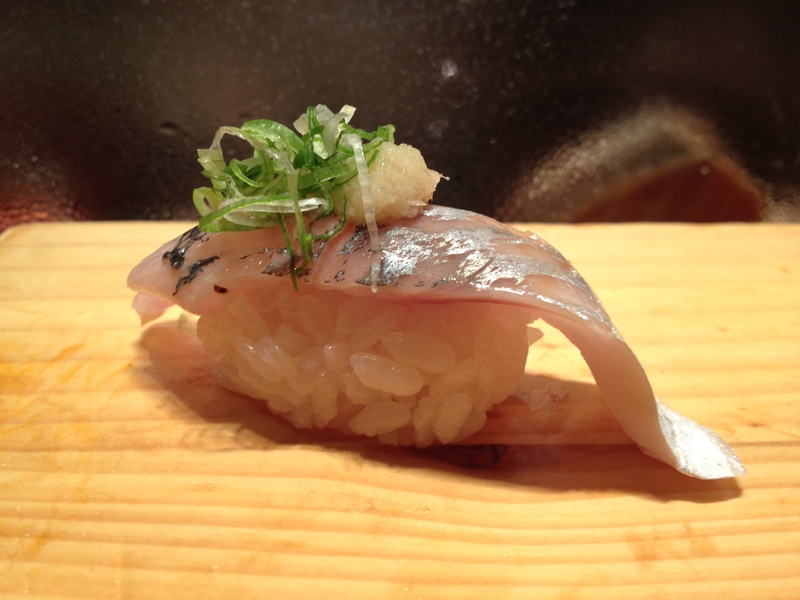 Monte: After the last couple underwhelming nigiri, Victor and I decided to call it quits. The chopped anago with avocado was deliciously creamy and rich, but we both thought the highlights of the meal were far behind. Still, it was a glorious meal and the omakase experience was incredible. The excitement and sense of wonder with each and every piece of sushi was really fun and most of the sushi pieces were masterfully put together. Again, even with my non-favorite pieces of fish, the rice remained perfect and was a joy to eat. And with my favorite pieces, the experience was uplifted to an entirely different realm of enjoyment that has been matched by few. If you get the chance to eat here, definitely try the salmon tomato. I think it’s a perfect showcase of the creativity behind Gari. Wow! You ate some appetizing sushi! How much did you spend for these? It cost more than we could afford, but it was totally worth it! !